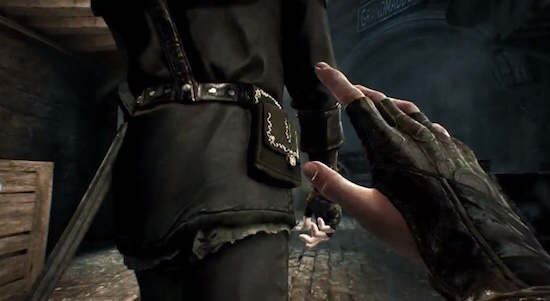 Thief is a series that dates back to 1998 when Thief: The Dark Project released for PC. 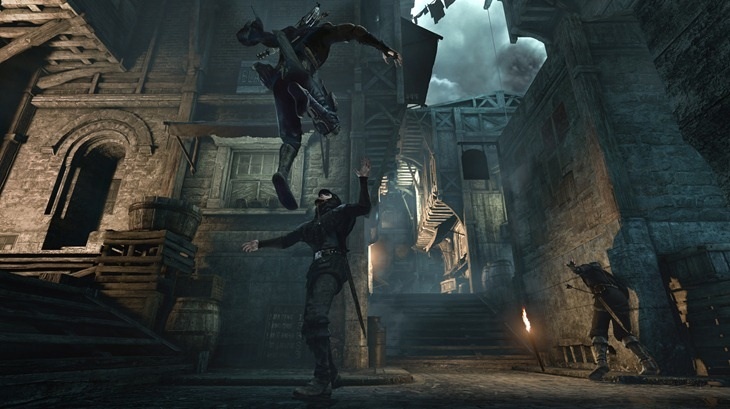 Thief was not your average game, and would actually be the pioneer of a genre. It is a series based on stealth, and it was the first to make sound and light important to sneaking. It also helped inspire and grow the stealth genre in games like Splinter Cell and Assassin's Creed. However, after the third title, Deadly Shadows, the series went on a long hiatus. The fourth title in the series would come 10 years after the last game had been released. It had undergone a few revisions and some employee turnovers, which most likely factored in to it's long development time since it was announced in 2009. I have never played a Thief game prior to this installment, which allowed me to have no series bias and no series baseline to work off. I noticed the game when checking out Steam's catalog, and the game picture for the game kept pestering me. I one day decided I would take a look at it and see what this was all about. I watched the trailer and began to get hyped for the game. I had recently watched a show involving a character who learned how to be a thief, and I saw parallels in the two. I also enjoy stealth games, and when stealth is an option in any way, I always pick to sneak over go in guns blazing. The thing that was also appealing to me was the fact that it was in first person and didn't slap a gun in your hands. Plus, who wouldn't want to play as a Thief? My experience with Thief was a positive one, and I would like to share my thoughts and opinions about it. 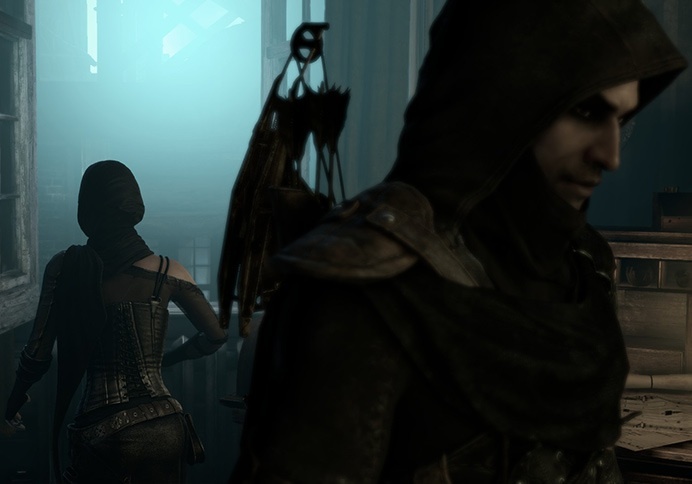 The story behind Thief is, admittedly, nothing too spectacular. You follow the story of Garrett, the Master Thief. He loves to steal from the rich and give... to himself. He is contracted out by a friend of his named Basso to steal the Primal Stone from the Baron's mansion. Early in the mission, Garrett runs into an old apprentice of his named Erin. She is reckless and too reliant on her tools rather than her own instincts and stealth. She and Garrett are in conflict with each others' methods throughout the prologue, eventually leading them to fight above a ritual that Garrett tried to get away from. Their struggle catches the guards' notice and Erin falls through the glass to the room below. Garrett attempts to catch Erin as he escapes the guards, but ends up getting caught in the collapse of the room. From here you follow Garrett as he uncovers the secrets of the City, as well as try to find out what happened to him and Erin at the Baron's mansion. Along the way he encounters the Thief-Taker General, the top officer of the guards, the House of Blossoms brothel, and some crazy supernatural phenomenon at the Moira Asylum. As the story unfolds, you kind of ask yourself what's going on because it's not really connecting. You still partake in thieving missions because that is the core of the game, but it's not all about the loot. Overall, I didn't really care much about the story of the game, but it's a pretty simple plot from beginning to end, and makes more sense as you progress through the game. But the game is more about its gameplay than story. This is what the game is really about. You have 4 levels of difficulty: Rogue, Thief, Master, and Custom. Rogue is the easiest and should be played on if you're relatively new to stealth and/or just want to progress through the story. 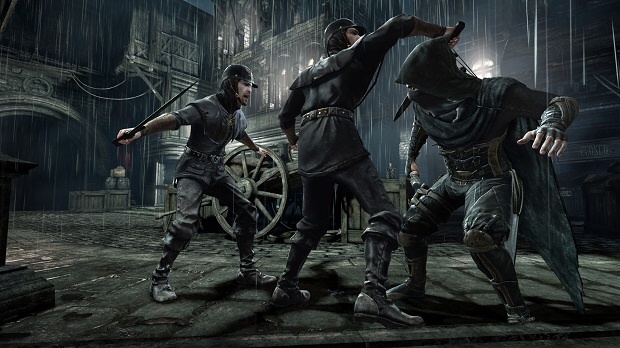 Thief is Normal difficulty where hop the challenge becomes greater where enemy hits deal more damage, the AI is a bit smarter, and your focus meter drains faster. Master is the expert difficulty. Your opponents will be deadly, essentially meaning in one or two hits, you're dead. Civilian knockouts or kills are not tolerated and result in a failure/game over. Your resources are more expensive, as well as upgrades. Your focus meter also drains much faster. Custom is where players will feel happy. You can change things fit how you want to play. Want to make the game where you cannot use focus, cannot takedown your enemies, or alert the guards? You can do all of that here. You can turn on one thing or all things, however you like. This can allow a challenge for people who feel the preset difficulties are too easy. I've mentioned focus, so what is it? Focus is kind of like Lara's Survival Instinct in Tomb Raider or any type in game guide to help you see things easier or to show you the way to wire boxes to disarm traps. It also allows you to perform stealthy actions more quickly and silently, and even more so if you increase your focus abilities. Focus will also make lock picking more easy so you can make quick work of a lock if you're trying to not get caught by a patrolling guard. You can steal anything that shines in this game. Anything you steal becomes currency for you. There are many homes you can climb into and plunder all their riches. So,e homes are occupied, others are not. You can also find loot littered across the rooftops or near guards who either stand their post or patrol the area. There are also collectibles that you can find which will be put in display in your base, the clock tower. These are valuable items that Garrett finds intriguing. These are often more difficult to find and will require extra exploring and/or special tools (that you only have to buy once). You must use the shadows to keep yourself concealed, and there is a shadow gauge in the lower left corner of the screen, wrapped by your health and focus meter. This gauge will show you the level of darkness you're standing in. The darker the shadow, the harder it will be for the guards to see you. However, if the watchmen get too close to you, even in the shadows you will be caught. The watchmen, the rich people on the streets, and the people that live inside their homes will have a sight meter that will slowly or quickly fill up based on how far away you are from them in sight. Once the meter fills up, they go into alert status one, which they will take a quick look around to see if they saw something. Alert status four is a yellow eye icon that displays above their head, and in this state, they will spend a lot of time looking for you in a wide area around where they noticed you. If they do see you or run into you, they will go into chase mode and pursue you and try to kill you with their swords. As a thief, you have limited weapons available to you, and most are non-lethal. You have your blackjack, a short blunt club used for non-lethal takedowns in close range. You also come equipped with a bow which has lethal and non-lethal arrows. Your arrows often times will be used to distract your opponents, or help mask your movements. Rope arrows will help you reach new areas or help you get around the watch. I love the gameplay a lot. It has some flaws to it, but for the most part, it's pretty solid and it definitely encourages you to sneak around rather than take your opponents head on. If you get in a fight with more than one guard, you should run or you will die fast. A stark contrast to many of the modern games we play today, and that's a big reason I like it. Some of the problems I do have though, there are times when you think you could get on top off an object, but can't because the game says you can't. There are also times when people get stuck in their alert phase and never go back to what they're doing, which does not allow you to go back to where you were. There are also birds and dogs that are around and are sensitive to your movement, and sometimes you don't know they are there until you swoop by them and they alert the guards. The visuals in this game are very good. I played on the PS3, but the graphics aren't bad there either. The PC and the PS4 have the best graphics and are very detailed at high settings (PC). 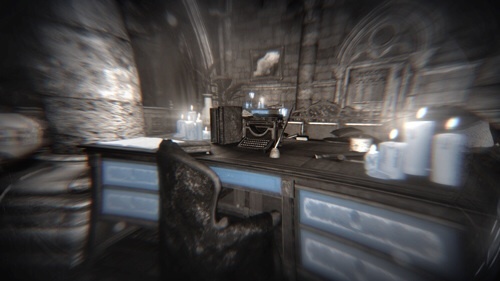 The setting is very dark and not filled with color, but for the steampunk setting, it fits just right, and since this is a game about stealth and using the darkness to your advantage, daylight and bright colors wouldn't help this game. Their is an issue, however, with all of the console versions. You will at times find the frame rate to drop a good amount for some cutscenes or transitions when textures are loading. There have been accounts where the PS4 drops to around 15 FPS. This is not a frequent occurrence, however, so it is not alarming. The audio shows you that hands were changed and this game was rushed. There will be times when conversations between NPCs will loop over and over again. It's funny at first, but then it gets annoying. The best example of how annoying it gets is in the House of Blossoms brothel. Once you start the loop of the dialogue, it does not stop in that room until you complete the chapter. It does fade out when you leave that particular floor, though. The audio does sound a bit off at times and sometimes the music will start play tense themes at weird times, sometimes when nothing is happening. I thought that this game was a good game all around, and I really liked it. There are some flaws with it, some not so bad and others that are pretty bad. However, it is not as bad as some reviewers have made it out to be. If you're looking for a stealth game that allows a challenge, then this is one you should look at getting. Obviously this game was rushed out the door, but hopefully this means the series will only get better. As a reboot, I feel like it should do it's job of getting new gamers into the series and have them play the older titles.